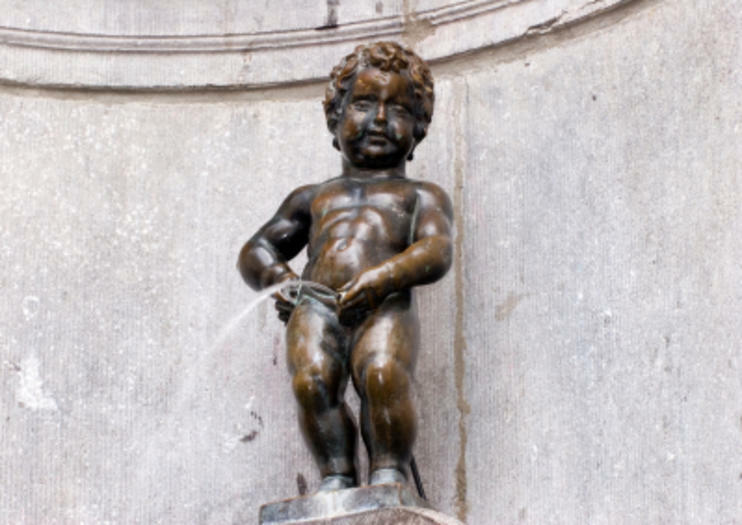 The Manneken Pis—sculptor Jerome Duquesnoy’s small bronze statue of a little boy urinating into a Brussels fountain—is one of Belgium’s most beloved landmarks. Built in 1619, the boy is hailed as the capital’s oldest resident and remains a favorite of both locals and tourists, with a host of myths and legends to his name. No Brussels sightseeing tour is complete without a photo of this cheeky little statue, and most Brussels tours make a stop at the Manneken Pis. While a Brussels city tour is the easiest way to visit, travelers can also take a hop-on hop-off tour to the Grand Place and walk a few blocks to see the statue. Themed tours such as food tasting excursions and Belgian beer walking tours often make a quick detour to snap a selfie with the city mascot as well. Keep an eye out, as the status is only 18 inches (45 centimeters) tall and can be easy to miss. The statue is protected behind a fence, so it’s only possible to admire it and take photos from a distance. The Mannekin Pis is tucked away at the corner of rue de l'Étuve and rue du Chêne, in the Ilôt Sacré area. From the Grand Place, take the street to the left of Town Hall and walk for three blocks—the statue will be on your left. Crowds can form around the Mannekin Pis in the busy summer months, making it tricky to get a good photo. Visit early in the morning or late at night to avoid the crowds. So adored is the Manneken Pis that it’s become a long-standing local tradition to dress up the little boy in a variety of costumes. It’s estimated that the statue has worn more than 800 different costumes over the years, and he often dons the national dress of visiting dignitaries. You might otherwise see him dressed in football colors, as a plumber, or even as Elvis, while his most glamorous outfit was a gold-embroidered suit gifted by Louis XV of France. His costume is changed around 30 times a year, and these occasions are marked with brass-band music and an unveiling of the newly adorned statue. On special occasions, the Manneken Pis even produces beer instead of water to celebrate with the people of Brussels.